When you are looking for a way to easily create a bill payment schedule to keep track of your finances and expenses, you can do so by browsing for a bill payment template online. With the use of a bill payment organizer you will have the ability to keep track of your finances without the help of a professional and without purchasing annual services to help with tracking the money you spend, owe and can save. Get your own bill payment organizer for free here! A bill payment organizer is a service or a product that allows you to keep a bill payment schedule for all of your household bills, rent or mortgage payments, loans and other utilities and expenses that you may owe. When you are using a bill payment organizer to help with keeping a bill payment schedule it is easier to keep track of your income and the expenses you owe and pay on a monthly basis. Utilizing a bill payment schedule with a bill payment template online gives you the ability to add in all of your monthly or annual bills and expenses into one spreadsheet, giving you the chance to view how much money you will need to earn in order to sustain your current lifestyle. With the use of a bill payment template online, you can easily add and edit various types of expenses and income types along with memos and details of each one to give you more insight into your overall spending and saving habits. 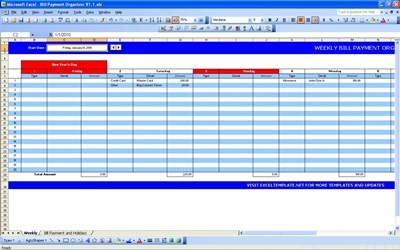 Using a bill payment template to keep track of your bill payment schedule will give you the opportunity to easily add and edit or remove expenses right from your own computer, consistently keeping the log updated and valid.